‘Getting to know you’ with ‘food, glorious food’! Would you like your group to meet each other in a fun, non-threatening way on the first night of a conference or get to know each other better while enjoying a fabulous meal? 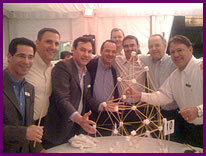 The Networking Dinner is just the recipe with a unique combination of fun, fine dining and team building. Our “Cocktail Party” game will start the evening off right with a fun and energetic get to know you “ice breaker” for the entire group. Then it’s fast-paced fun as you eat at a different table with different people for each course: appetizer, salad, main course and dessert. Each course features a table top game or exercise for everyone to do together that gets your team interacting and having fun while improving team skills. Depending upon your group size, each participant will be able to dine, interact, play and have fun with over 40 new people! The Networking Dinner can be done in the restaurant of your choice (or we can also help you choose), a banquet room of a hotel or even in different restaurants for each course. Our energetic and fun MC/facilitator leads the tabletop games and exercises, coordinates the changing of the tables and even works with the restaurant on the timing of the courses. Table hosts for each table are also available at an additional cost. The Networking Dinner is a great way to have fun, celebrate successes together or create a springboard of enthusiasm and energy for a meeting, off-site or executive retreat! A complete module on business eating etiquette can be included in the Networking Dinner to give your people a competitive advantage when meeting prospective clients. This program can also include a debrief of team performance around the value of knowing and liking each other on a personal level, communication, and working together by a trained facilitator. The debrief can be customized for your group goals. 2-3 hours. The program is a great ending to a full day of teambuilding or incorporated into a day or multi-day program using work-style assessments such as MBTI and Strengthsfinder. Fun, silly prizes can be awarded to top-performing teams.